My little girl is growing up. And she thought her bedroom was too childish, and wanted something more mature that she can "come home to from college." Crap. That whole college thing is really just a couple years off. When the heck did I get this old? Also, where are all those Barbies and dress up clothes that used to be in this room? 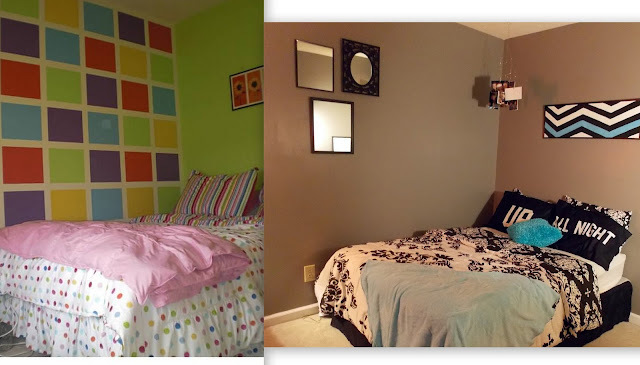 Emma's room was really fun and bright and colorful before. The dresser is evidence of that... and the walls of her room were intense. Three walls were neon green, and the fourth wall was an awesome grid of random colors, precisely measured and painted by my wonderful hubby when we first moved here. 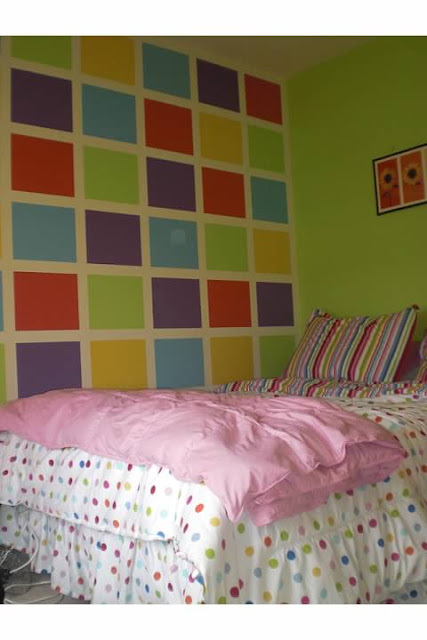 The striped and polka dot bedding in the same bright colors kicked it up a notch. We LOVED the awesome painted grid wall for a long time. And then, it got a little old. The new, neutral gray walls will match whatever bedding Emma decides on in the future. 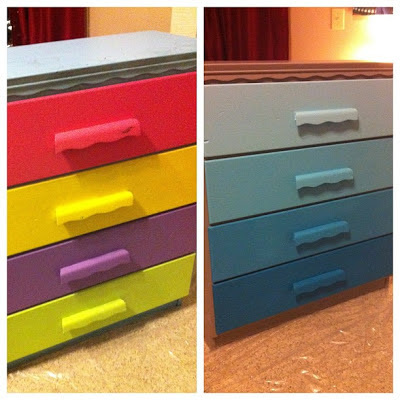 Also the dresser is basically the best thing ever. The newly painted dresser in its redone room. We painted the sides and top the same color as the walls and you really notice the blues that way. The wall next to the bed has the start of a random mirror collection that was also inspired by Pinterest and looks pretty neat so far. Emma painted the chevron pattern now hanging above her bed. She's got some talent! I think the new bedding that somebody's cool mom bought for Christmas really ties it all together. This was a fun day of completely transforming a room! Now if I can just convince my son that he needs a room makeover too, I'll get to take more before and after photos!